After three days of intense battle amidst the top roller derby teams in the world, the Rose City Rollers of Portland, Ore., U.S., will be taking the coveted Hydra back to the Pacific Northwest after defeating the reigning champions, Victorian Roller Derby League of Melbourne, Australia, 144-121. 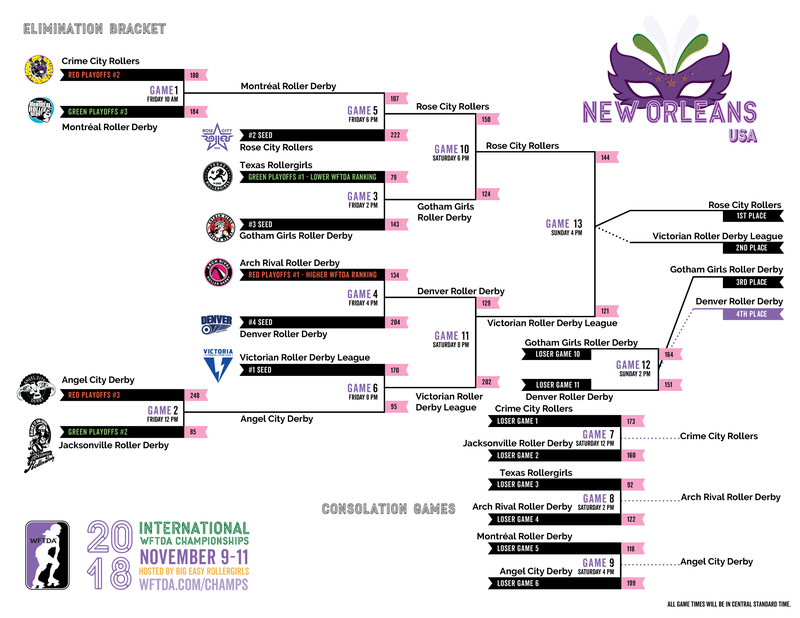 The 2018 International WFTDA Championships New Orleans highlighted a closing gap in the competition among the top teams of women’s flat-track roller derby, as several match-ups that ended in blowout scores on previous occasions turned to nail-biters in their 2018 rematches. Last year, Victoria took an early and commanding lead against Rose City to become the first non-US team to win ever to win first place at the WFTDA Championships, with a final score of 180-101. This time around, the score often fluctuated to within a few points before Rose City was finally able to seal the victory at the end. Likewise, Gotham Girls Roller Derby of New York, N.Y., U.S., went up against Denver Roller Derby of Denver, Colo., U.S. for a rematch of their 2017 meeting at Champs. While both games saw Gotham take home the bronze, this year’s game was noticeably closer, with a narrow 13-point win for New York. Another rematch in this year’s tournament was a thrilling showdown between Montréal Roller Derby of Montréal, Québec, Canada against the Crime City Rollers of Malmö, Sweden. For the second year in a row, the tournament kicked off with Montréal squeaking out a victory against Crime City. Other strong performances of the weekend came from the upset of Angel City Roller Derby, Los Angeles, Calif., U.S., (A Coruña #3, WFTDA #9) over Jacksonville Roller Derby of Jacksonville, Fla., U.S. (Atlanta #2, WFTDA #6) with a commanding 248-85 victory. Denver also had a minor upset as the number five-ranked team in the WFTDA, defeating number four, Arch Rival Roller Derby of St. Louis, Mo., U.S. on the first day of the tournament. This marks the third Hydra victory for Rose City, which they also took in 2016 and 2015. Gal of Fray from the Rose City Rollers’ Wheels of Justice was named tournament MVP after a stunning display of athleticism for the team this weekend, and an especially powerful performance during the final game. The awards ceremony also honored Ivanna S. Pankin with the WFTDA Legend Award, which recognizes an individual’s outstanding commitment to and action towards carrying out the WFTDA’s mission. Ivanna is indeed a WFTDA legend, as a founding member of the WFTDA Board of Directors who has started multiple leagues, and is also the mastermind behind RollerCon. The winner of the Derby on Toast Bracket Challenge was ZipDrive, who predicted a perfect bracket. Thanks to everyone who played this year’s Bracket Challenge! Congratulations to all of the participating teams, and thanks to all the officials, announcers, photographers, and other volunteers who made the weekend in New Orleans such a success! Special thanks go out to tournament hosts Big Easy Rollergirls for welcoming the WFTDA community to vibrant New Orleans. If you missed out on any of the action this weekend, check out game photos and recaps at Championships Tournament Central, and watch the game archives on WFTDA.tv later this week.